Blair Outhwaite has completed a year of study into the Hauraki Gulf’s bottlenose dolphins. Photos: Blair Outhwaite. 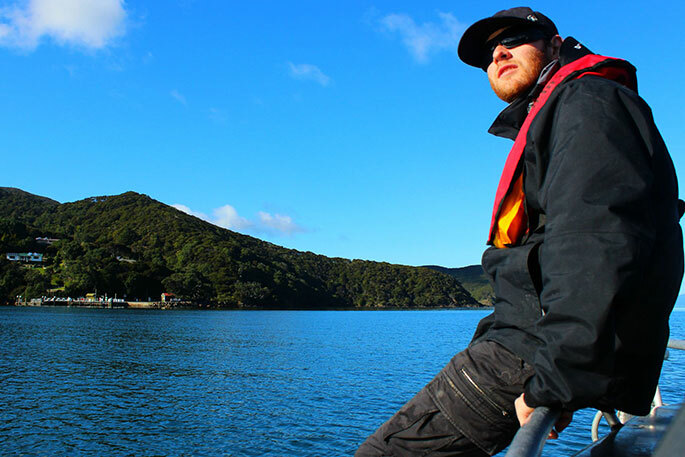 More than a year of fieldwork and a further year of writing resulted in Blair Outhwaite’s 181-page thesis called The Ecology of the Bottlenose dolphins in the Hauraki Gulf, which he completed last month. Data was collected through Facebook, a dedicated research vessel and the local whale and dolphin watching boat (Auckland Whale and Dolphin Safari) around the Whangaparaoa and North Shore coastlines. Among the focus points of Blair’s work was the contribution that citizen science – the observations of members of the community – could make to dolphin research. Blair became aware of the Whale and Dolphin Watch Whangaparaoa Facebook page, which started in 2014. Here, members post photos of local sightings that became a resource for Blair’s studies (HM October 1, 2015). He has dedicated a chapter of his thesis to citizen science, using the Facebook page as a key example. He says since then, he and a colleague started a North Shore page and similar pages have been set up in East Auckland, Waiheke Island, Wellington and Dunedin. “It definitely added to what people already knew about dolphin movements in the area,” he says. He says earlier studies found that bottlenose dolphins were encountered most frequently in winter and autumn within the inner Hauraki Gulf, and the least in summer. He says that the distribution of bottlenose dolphins during summer appears to be concentrated towards the middle and northern areas of the inner Hauraki Gulf. Travelling was the most recorded behavioural state, which is similar to other populations in New Zealand. “It is possible that bottlenose dolphins use the Whangaparaoa and North Shore coastlines as a corridor to other foraging areas either within, or outside the inner Hauraki Gulf,” Blair says. Now that his thesis is done and dusted, Blair is taking a break after more than six years of study for his Masters degree. The absence of bottlenose dolphins from the study area during summer is expected given these results, as bottlenose dolphins are generally sighted in deeper waters, if at all, during summer periods and the Facebook sightings are largely limited to land based observations.